Hello March! Glitter and Juls | Savannah Life and Style Blog | Affordable Fashion: Hello March! I can't believe we are in the month of March already! I love this month because my birthday happens to be on the 24th and now my baby will share the same birthday month as me too. Well, that's what it is looking like. I'm still playing baby incubator at the moment and I have a doctor's appointment tomorrow and I don't know what to expect. If all goes well I won't have to go back to the hospital unless I am going to go home with a baby. My sister threw me a baby shower last month and I still don't have the pictures from it but I did take a picture of the gorgeous cake Tanya (my kind of sis-in-law) made me and the beautiful diaper cake my girlfriend, Lauren made me. (isn't is so cute??) It's in Ava's nursery now. This week we received another surprise from the New Baby Welcome Wagon. I still don't know who they are. Hopefully the mystery will be solved soon. We got some burp clothes and a musical froggy toy (that Paxx tried to get his paws on). Everyone must have wedding fever because yet another one of my close friends is getting married. Noah and I will be attending like 6 weddings at least this year. Congrats to Brett and Christine! Brett is another one of my close friends from elementary school. I'm so happy for him! I also left out another couple getting married this year. So hard to keep up I swear! Noah is the best man for his best friend, Paul. 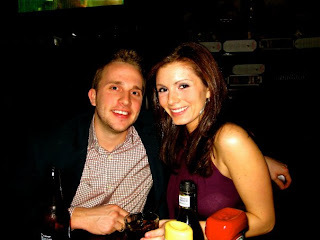 Paul and Derin are so cute and they are getting married in the fall. Congrats to them too!